The dance floor at Boulevard 3 is surrounded by Tannoy V300 speakers, concealed behind potted trees to help keep the sleek look of the club uniform. (Inset) Six all-weather Tannoy I6AWT-60 speakers are hidden behind trees and bushes near the club's outdoor cabanas, where guests can escape to relax. hollywood, ca-Since it was built in 1924, the Hollywood Athletic Club has been a star-studded landmark with an incredible reputation. Once the tallest building in Los Angeles and the site of the very first Emmy Awards, the location fell into the background in recent years and ultimately closed-until former owner of the world-renowned Skybar, Peter Familari, chose it as the site for his new venture, Boulevard 3. Familari sought to create a glamorous nightlife destination, and wanted every detail to match the high-end concept. As part of this design, he had the sound in mind from the start-he was familiar with the sound that Tannoy speakers delivered because they were used in Skybar, so that's what he hoped to use for his new space. "When we talked to Peter he said he was in love with Tannoy speakers, that he loved the way they sound and he knew they were good studio monitors," explained Bill Sage of Delicate Productions, who worked alongside Audio Geer to find the sound that Familari was looking for. "He's got impeccable taste, and he knows what's good quality." Dudley McLaughlin of Audio Geer, who had worked with Familari previously on Skybar, says that besides ensuring quality sound with various speakers from Tannoy, part of keeping the design clean required a sleek look. So began the creative process of concealing the speakers throughout the club. 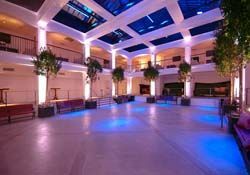 The main dance floor is a large, open space that was formerly the swimming pool of the Hollywood Athletic Club, and is bordered by pillars, which is where Tannoy V300s were hung. "We needed speakers with pattern control, that's what Tannoy offers," McLaughlin explained. "We needed fidelity and intelligibility at high volume levels, which those provide." They are camouflaged by potted trees, but deliver quality performance to the space. "When you're on the dance floor, you wonder where the sound is coming from," he said. "It sounds so good, and even I can't see any speakers." In addition to a lively dance floor, Familari wanted to create some homey environments where guests could escape from the bustle if they so desired. Upstairs around the perimeter there are several private booths, which feature Tannoy's CMS501BDCM ceiling speakers. "He wanted speakers that could be turned up, but would still sound like a studio monitor-loud, but not blaring loud, where you can still understand the music," McLaughlin said. "Tannoy is renowned for that." The club blossoms into the outdoors with several relaxing cabanas, another spot where guests can gather to relax with the music from indoors carrying over through six all-weather two-way Tannoy I6AWT-60 speakers hidden behind trees and bushes. "There are some concerns with noise out there, even though it's on Sunset Boulevard and there are no real neighbors," said Sage, "but they didn't want it to get totally out of control. In the courtyard, we used just a few speakers to get the nice feel. They didn't want to overwhelm it. If somebody doesn't want to dance, they can go out there to relax." After McLaughlin and Sage mapped out what would work best in which area, Sage enlisted Curtis Kelly, Delicate's lead designer and programmer, and he chose BSS Audio Soundweb London for the programming. Additionally, they chose Lab.gruppen amps for the venue, based on prior experience using them with Delicate's sister production and touring company. "When we get involved with people we take a lot of the technology that we use on the road because we see that it works out there, so we try to incorporate it into an installation," explained Sage. "If you can put it in a truck and it can go for 500 miles and it still works the next day, then it's probably got a good chance of making your customer happy. It gives us confidence: we can look them straight in the face and say hey, this stuff works. The Lab.gruppen amps are rock-solid." Control of the system is concealed downstairs, underneath the former pool. A single rack holds all the gear, including a BSS Soundweb London BLU-10 programmable controller, which provides a simple automated interface for the managers and other users. Additionally, the audio can be switched easily over to the DJ booth if that will be featured on a particular night. "They did a nice job-they wanted to make it feel like you were going into a nice mansion somewhere, and they pulled it off. And it sounds really good, they're just thrilled with it," said Sage. "The people that are involved are such nice people," he added. "We always sort of get attached to our customers, and then you get the job done and all of a sudden you don't hear from them as much, it's kind of like a breakup. This was a great project for us."